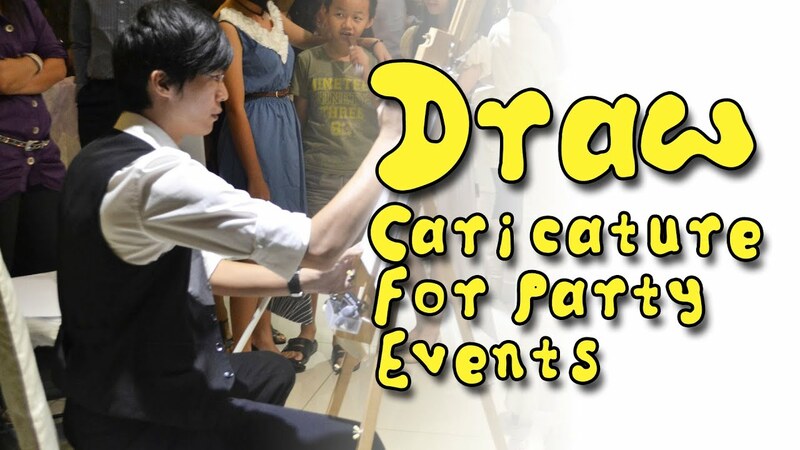 Triton Lim, specialize in Live Caricature Entertainment for various event such: Wedding, Private Birthday, Annual Dinner, Family Day, Conferences, Product Launching, Roadshow & Others. Having caricature entertainment in your event may be once in life. But the happiness, the smile, big laughing until tears, still fresh in mind until now. How many caricaturist working with you? I’m solo. Recommended search via Google, if you prefer others. I having 300pax people. Would you manage draw all the guest? Two method recommend here. i) Hire few caricaturist via Google. ii) Snap photo of the guests. Drawn after event day. Delivery to you when finished. Could I kindly have the drawings not so “cartoon-like”? Triton Lim draw with his own personal style. Client must fully understanding the difference in between Caricature and Portrait. Can I add company logo at the drawing templates? Adding company logo, event date, venue, and specific body, are available in Live Caricature Traditional & Digital. Can I request draw on plastic bottle & cotton material? I’m not recommended draw on plastic material surface, due not long lasting. However, up to you. Drawing on cotton material surface still fine. *limited support for those who provided lack info. Improper/ irrelevant inquiry content would not be entertained. Can I book you for outstation event? Yes. I’m based in Selangor. Any outstation event, air ticket + transportation + accommodation, is bear by organizer/client. Once you confirm the Invoice. You may start to pay. Can I pay you after a month? Deposit advance. Balance clear on the event day. Or full payment make in advance. NO delay. NO after event day. Extra pay for additional hours? How many person can drawn in 1 hour? Easel stand, pen, papers and others material included. How many people can you draw an hour? Approx 7 ~ 8 person. What do I need to provide on spot? Electricity switch point/extension plug. 2 or 3 chairs. Small desk for putting printer setup. Make sure covered area’s is concrete floor. No shaking floor/stage. No lighting on top which lighting reflection on the tablet screen will bring uncomfortable to eyes. Would you able, if our company like to hire you for ours latest tablet device and drawing app? We are happy that you provide us a set of tablet device/drawing app 2 weeks before at least. Bear in mind, artist not only focus on one task. More time given is good for artist preparing. Triton already co-operated with Surface Pro, Konica Printer & HP. Every Caricaturist have theirs personality and drawing style. Choose wisely. “Big head” small body doesn’t mean Caricature. “Tracing” outline doesn’t mean Caricature. “Portrait” definitely not Caricature. They are Cartoon style, Big eye style, Local style, Portrait style, Q style, Realistic style, Tracing style, Unknown style and so on. Understand yours caricaturist and giving the best humor funny moment on yours special event.